Bruno was born of an aristocratic family. You could see this in the way he carried himself, in his serene and confident look, in the way he elegantly folded his long legs as he sat by the bay window in our home. Bruno, in his early years must have been forced to flee from something or somebody because he ended up at the North Shore Animal League where we rescued him in 2001. We left the task of naming him to our youngest daughter. She agonized over myriad choices. None seemed to fit Bruno’s haughty bearing, athletic personality and his colors. A few days later, on October 6th, at Sunday Mass, it was the feast of Saint Bruno. Somewhere between the reading of the Gospels and the final blessing our new dog got his name. Saint Bruno is the founder of the Carthusian order who was noted for his learning and for his sanctity. Like his sainted namesake, our Bruno was attracted to the eremitical life inasmuch as he did not crave the company of other dogs. He eagerly embraced a life of relative poverty, manual work, contemplation and didn’t follow any written rules. He garnered the affection of all he met. Again, like Saint Bruno, he will not be formally canonized because of his aversion to public honors. However we will remember him every day and especially on October 6th. When I decided to write my book “Driving Straight on Crooked Lines,” Bruno kept me company in the early morning hours as I stole time from my regular workday to pen my memoirs. He kept reminding me to live in the moment and not to obsess about the past or the future. He constantly pointed out that life, in all its splendor, is lived in the here and now. The past is gone, the future has not yet come – Bruno showed me how to live in the present moment. Bruno, like all dogs who adopt humans, showed me how to be more human. He gave me an example of carefree joy, unwavering loyalty, and unconditional acceptance showing me that life isn’t all about me. You can get self-involved when you try to write a book, when you lose your job or you worry about your pension funds in a global recession. That is until you have to walk, feed, belly scratch and play with your genuinely aristocratic buddy who insists on reminding you of the common courtesies so often forgotten in this man-eat-man world. Bruno started failing a couple of months ago but he never complained. In fact he was as kind as could be with our grandchildren and enjoyed their company more than ever. Except he was more content to sit with them than to steal their soft toys. 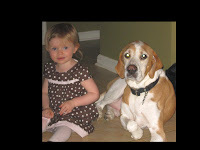 Yesterday, my youngest daughter and I cried softly in our veterinarian’s office as we said goodbye to our friend Bruno. We’ll remember the lessons he taught us and be forever grateful that he adopted us. I think of Saint Bruno's words in a letter to his friend "The loyalty you have shown during our long and mellowed friendship is all the more beautiful and remarkable in that it is only rarely found."